our leaders and other protesters in the rally that coincided with Pres. Aquino’s 4th State of the Nation Address yesterday. It is reprehensible that those fought the Marcos dictatorship and who paved the way to where Aquino is right now, suffer the same police terror not unlike the martial law days. 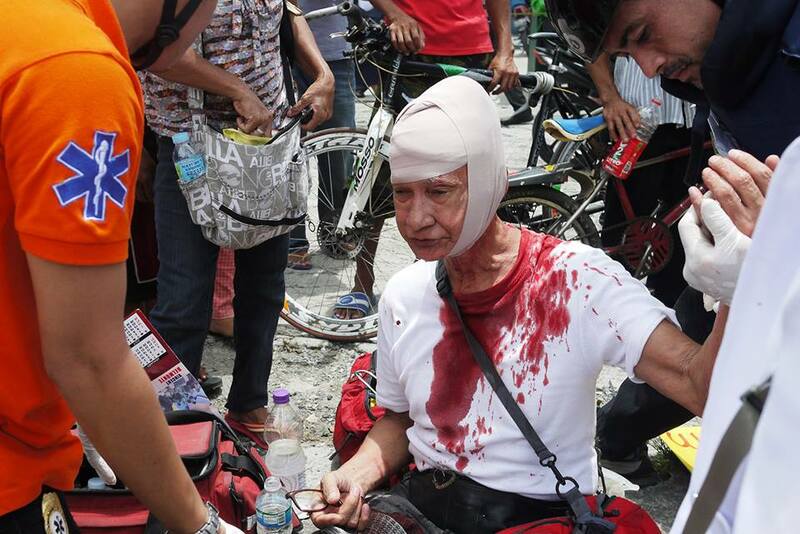 77-year old Rodolfo “Ka Rody” del Rosario, former political prisoner during martial law and vice-chairperson of the SELDA NCR chapter, suffered from head injuries after police hit him with a nightstick. He was at the frontlines of the People’s SONA ng Bayan that asserted, in a clear exercise of their right to assemble and to protest, to get near Batasang Pambansa where Aquino’s SONA was held. victims of human rights violations. This is now Aquino’s 4th SONA, and after countless letters, lobbying efforts and rallies, the Human Rights Victims Reparation and Recognition Act signed last February 25 remains ineffective and stagnant. Martial Law victims have yet to be recognized. We demanded justice not only for us victims of human rights violations. We demanded justice for the greater majority of the Filipino people who continue to struggle for their most basic human rights. Yet, Aquino’s “inclusive growth” only pushed further the rights of the people to food, shelter, healthcare, education, land and livelihood to the sidelines. The People’s SONA yesterday was a testament of the people’s right to express their discontent because their basic rights are violated. Only the few rich and powerful , who bleed the people dry, enjoy the so-called growth. These are the same group of elites who are favored by the Aquino government’s policies, at the expense of the people who bear the burden of high prices, privatization of services, meager wages, forced eviction, landlessness and the overall crisis passed on to us by Aquino’s imperialist masters. We protest the denial of a permit to rally, the use of concertina wires, the blocking of the roads with container vans and fire trucks; the truncheon-bearing police who mercilessly hit the protesters, the illegal and arbitrary arrests and detention and the wounding of rallyists—literally the same scene and horror during the times of the dictatorship. We demand that the PNP be made accountable for the violence that ensued in yesterday’s rally. We also demand justice and accountability for the illegal arrests and detention made by the police. We deplore the statements made by the Commission on Human Rights, which instead of ensuring that the police do not use force against the activists, irresponsibly maligned the protesters by saying it is the protesters’ fault that the police used violence against them.